Here’s a Thanksgiving tip. Generally, your turkey is not cooked enough if it passes you the cranberry sauce. I can’t remember exactly how many years that I have been making Ina’s cranberry conserve, but obviously too many to count…for just as many years we gather at my neighbor’s house and my contributions are always the same as requested the cranberries and the oyster dressing it just wouldn’t be Thanksgiving without them. 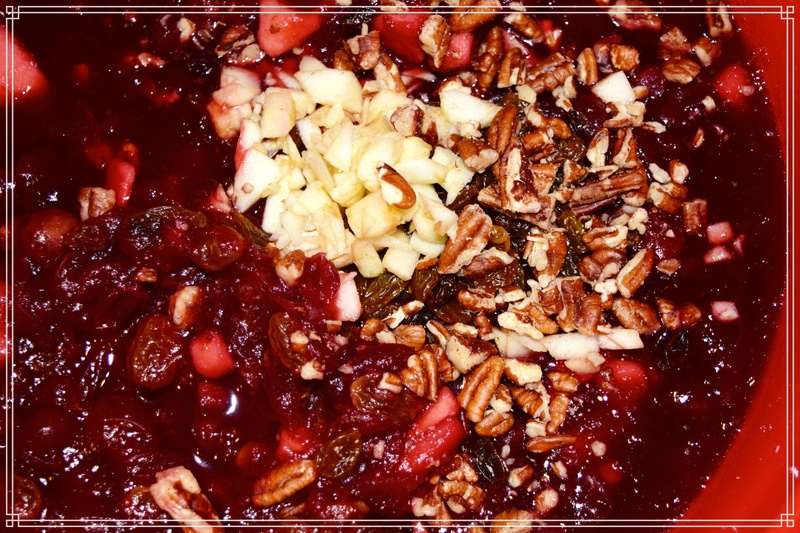 We buy the big Sam’s bags of cranberries and I make enough for Thanksgiving and Christmas…it freezes well and of course, leave out the nuts when freezing adding them the day that you serve the conserve. Cook the cranberries, sugar, and 1 cup of water in a saucepan over low heat for about 5 minutes, or until the skins pop open. Add the apple, zest, and juices and cook for 15 more minutes. Remove from the heat and add the raisins and nuts. Let cool, and serve chilled.